Home furnishing enthusiasts may find themselves indulging in an extended spending spree this holiday season, with Crate & Barrel closing its iconic Brattle Street store on January 25—a move likely to be accompanied by obligatory clearance sales, according to store manager Lauren Boccuzzi. The Brattle Street store, opened in 1979, was one of the chain’s first Boston-area establishments. 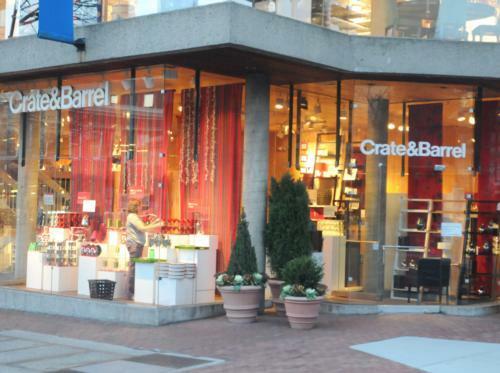 While Crate & Barrel has no current plans to close its other Cambridge store on Mass. Ave, a fire ravaged its Back Bay outpost this past weekend, shutting that branch down indefinitely. Boccuzzi says her store has a strong local customer base and has been very steady in its sales. Instead, the closing may come about because of the building in which the Brattle Street store sits. The jagged concrete and glass edifice was designed and developed in 1969 by the former Harvard Graduate School of Design chairman of architecture, Benjamin C. Thompson. A biography from Thompson’s architecture firm credits him with renovating the Harvard Yard dormitories in the 1950s and helping to persuade the University to renovate—rather than demolish—Boylston Hall. The Brattle Street building served as the headquarters for his legendary (and now-defunct) home furnishings company, Design Research. Thompson and Design Research are credited for bringing the bold and colorful textile designs of the Finnish company Marimekko to the United States. Crate & Barrel has a long partnership with Marimekko, having featured its highly-popular textile designs on its bedding ensembles. Indeed, the building’s architectural magnificence may have contributed to Crate & Barrel’s decision to leave. Boccuzzi said that the closing was in no way triggered by the slumping consumer market, and that the company has been examining its usage of the Brattle Street building for years. Building owner and Harvard professor emeritus Bill J. Poorvu and Harvard Square Business Association executive director Denise A. Jillson both expressed similar thoughts, saying the closing was likely driven by changes in the company’s merchandising strategy. Jillson praised Poorvu for his careful consideration.